I made my lunch first thing this morning, so that when I came home all mellow from my swim and massage, I could sit down to eat. I only get about one per year, so I really try to savor the day. Instead of jumping into my sewing, I wanted to try painting a starling. I know I'm often qualify my watercolors as a bit amateurish, but that is really because they are. I don't seem to have enough discipline (because I'm usually sewing) to put in more practice time. It's the first time I've tried the starling, and birds are also new for me. 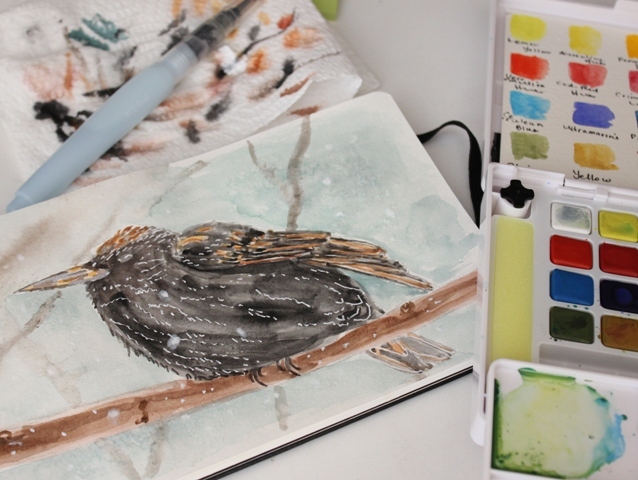 One problem I had with the starling was how to portray the white markings. For all the white markings, it might have been best to use frisket, a liquid resist which can be rubbed off after painting; mine, however has dried up. 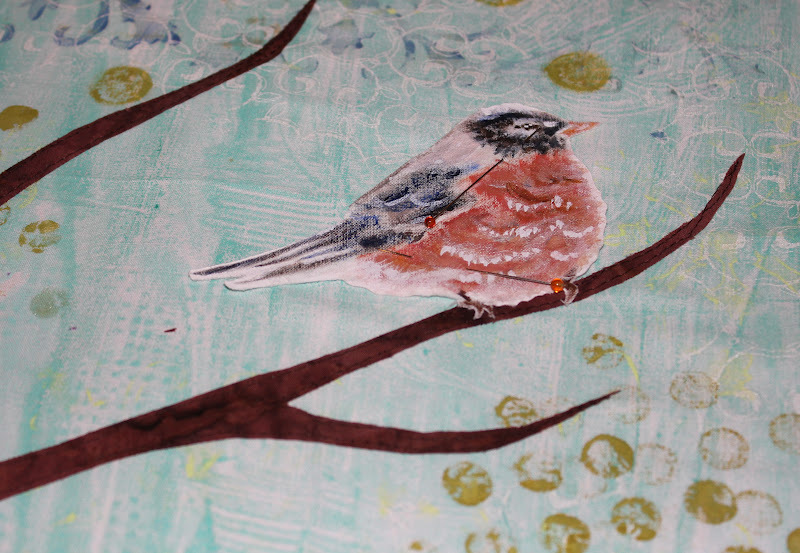 So, I went ahead and painted the bird and added the white afterwards with ink. 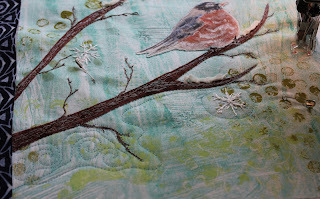 On the robin, I finished stitching the branches, sandwiched it and starting the quilting. I stopped because I don't like how that's going. The swirls look more like waves than wind, so I believe I'll be picking it out. The small bit of blue on the side is a possibility for binding but I'll have to try others first. Of course I found the perfect bit, blue with orange and green dots but I don't have enough left. 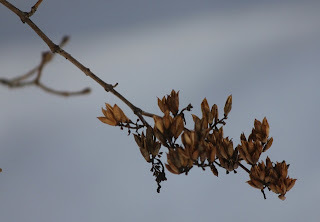 When I sat down to sew, these lilac seed heads just outside my window with the sun shining on them caught my eye. Don't ask me why, it's not as if I'm stressed out or have been working too hard, I decided to take a little more me time this week. Yesterday, I went for a nice long walk with my husband, and this morning since I wanted to go downtown to pay a bill and go to the library, we met for lunch at our little independent bookstore on Main street. Gord is always late so I bought a paper and read while I waited. 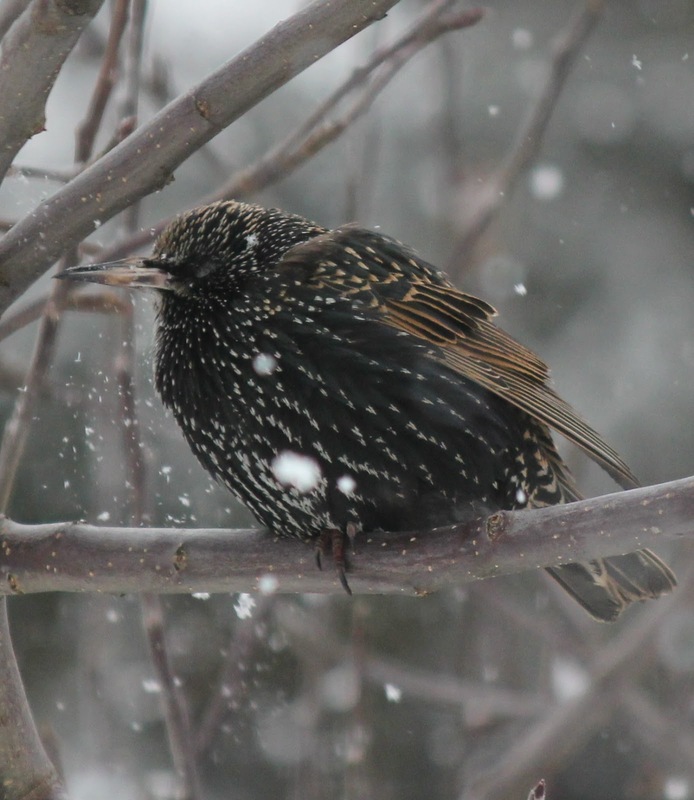 Once home, I got distracted by some starlings in the apple tree and had to take some pictures. I really must try painting them. I love their sparkles. 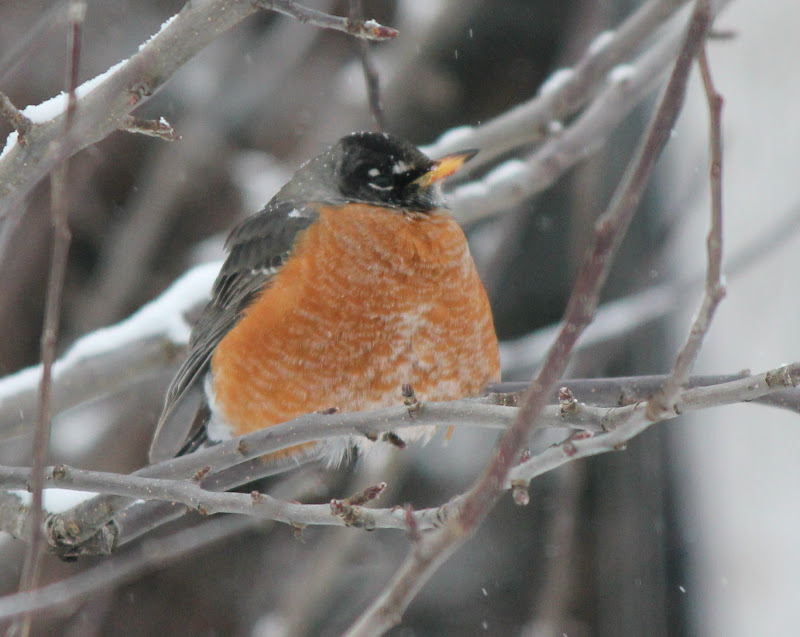 The robin was back all puffed up and resting in the tree this morning too. He seems to like the birdbath for fresh water. 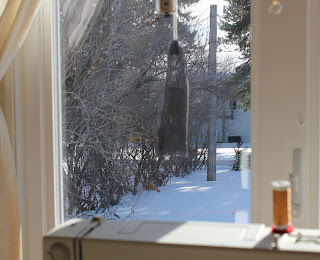 since all our apples are gone, I got the idea to put a crochet hook through an apple to pull some wool through for hanging. 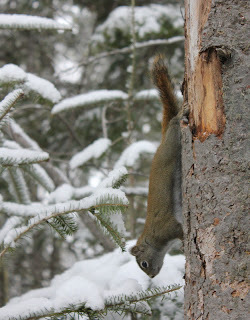 Gord put it in the tree but he hasn't found it yet. My roses from Valentine's Day have all been thrown out except for two which I sort of ignored, and now I can't throw them out. 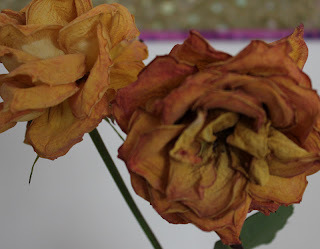 Isn't the color of the dried petals pretty? 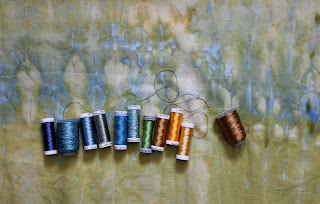 On my cutting table I've arranged my dyed piece with the batting and backing. I've been picking through my threads and fibers for matching colors. 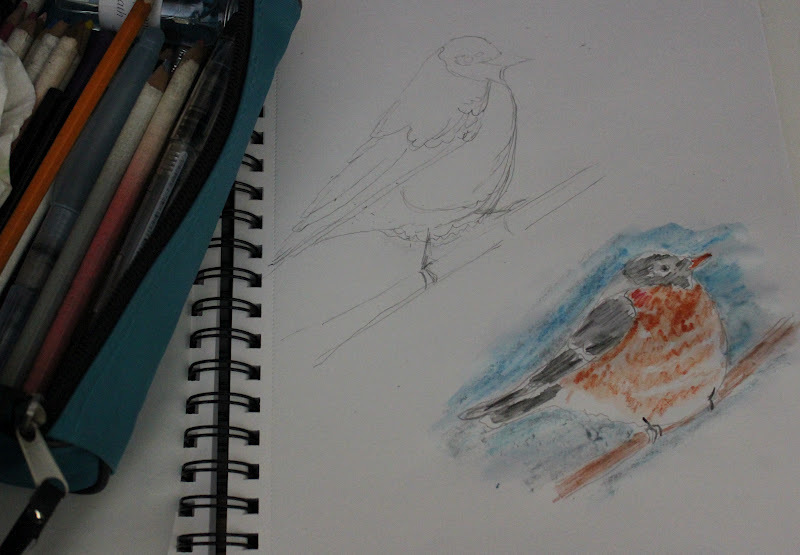 While I finish the robin I'm already thinking about how I shall do this piece. I can start it but I may need to order some fore fibers in the colors I want. I've added another few bits to the robin piece--this time some small branches using 2 threads at once in the needle (size 90). I also added a few more snowflakes with Sulky's hollow shimmer. I switched to an embroidery needle for this and stitch quite slowly to avoid breakage. The hollow shimmer is fine and it almost feels like plastic. I use it in almost every piece for a little touch of sparkle. Hopefully if you enlarge you'll see it better. Oh, and tomorrow in addition to my usual swim and sauna at the spa, I'm getting a massage, been saving a while for that. I learned something new this weekend thanks to some bloggers and Google. I never knew how to re-size my photos; I know I should have known that for the blog, but it has all been such a learning curve. I discovered that I can re-size in Picasso or I can re-size using Microsoft picture editor which is what I just used and might be the easiest. It's a little thing but so exciting when you figure something out! 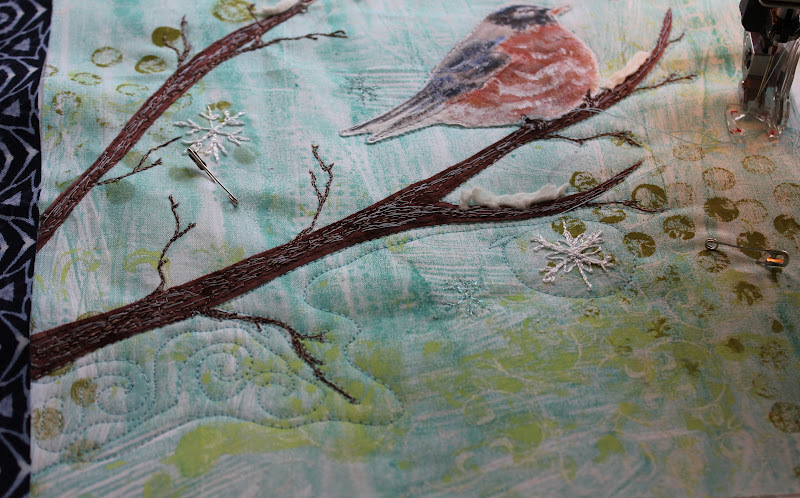 This afternoon sitting at my machine in my sunny window, I free motion stitched the robin to the background, added a little stitching and snow to the branches, and then added 3 snowflakes using the bobbin work method. I'm getting addicted to that. 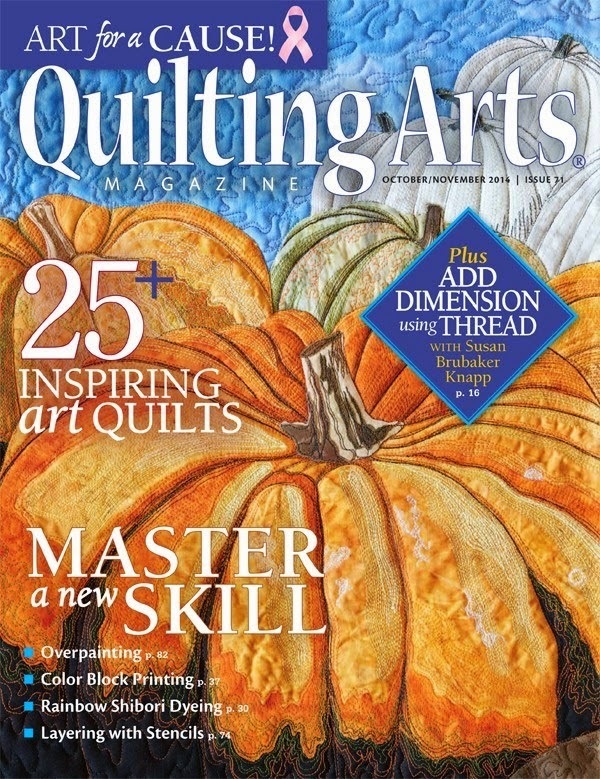 I've sandwiched it and I'm ready to quilt it. 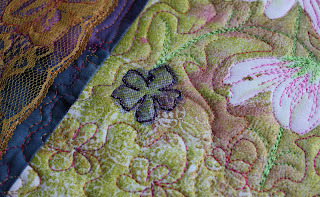 I just have to decide how I will do that--swirls I think in a color that will blend. Now, I'm heading out for sunny walk. 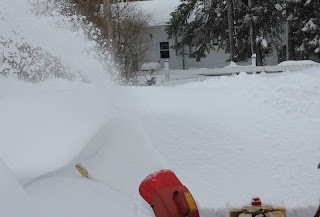 We just got yesterday's fresh snow out of the way and we got hit with the biggest storm we've had yet this winter. It was heavy and difficult to get up and over the banks. I wasn't able to help much. The front walk was so drifted over I couldn't shovel it, so we left it for tomorrow. Gord pushed his way out the back door and I manged to push some of the snow aside from the back step. It was too heavy for me and I had to give up. 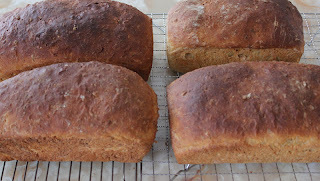 Since I never seem to get a full day without something I have to go out for, I welcomed the storm so I could make porridge bread and vegetarian stew. 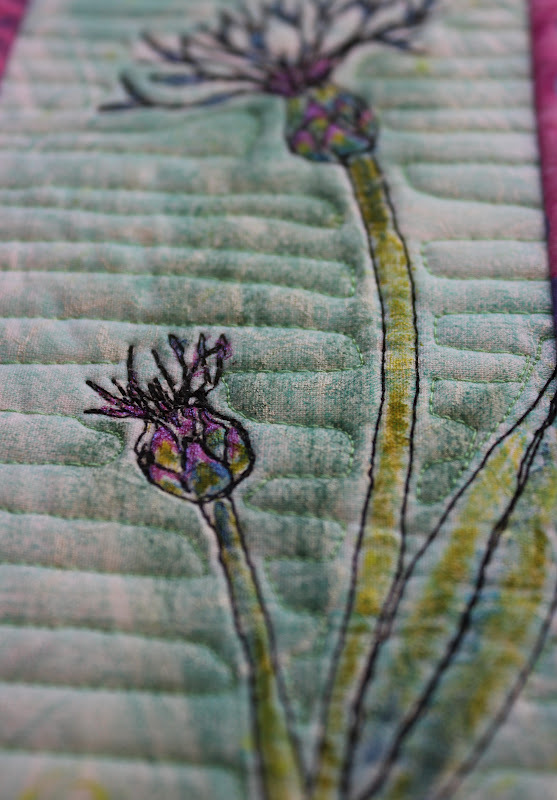 When I finally sat down to my machine, I was so exhausted that I was too shaky to sew. I made a tea and finished reading a book instead. At least I have committed to this piece though. 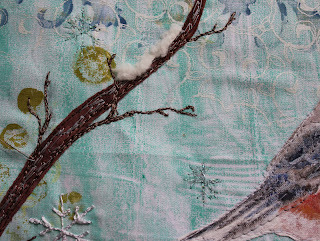 I stitched the branches on and lined it with interfacing, so I'm ready to proceed with a little free motion texture to the branches and some snowflakes next time. I have a couple of questions. First of all, does anyone have problems with viewing my blog as far as loading the pictures? I confess, I'm not very savvy when it comes to some of these things and I'm wondering about picture size. I usually crop them in Picasso as I don't have a photo software. Also, today, I tried to change my profile picture and it said I had reached my upload quota and would have to buy more space. Has that happened to anyone? This is what I got up to this morning. It is taken through my studio window. While it is a beautiful day, apparently a real nor'easter is coming to-night with another 30 cm of snow. Therefore, I've been out most of today, picking up the odd thing in case we can't get out tomorrow, getting my hair cut and having lunch with friends. 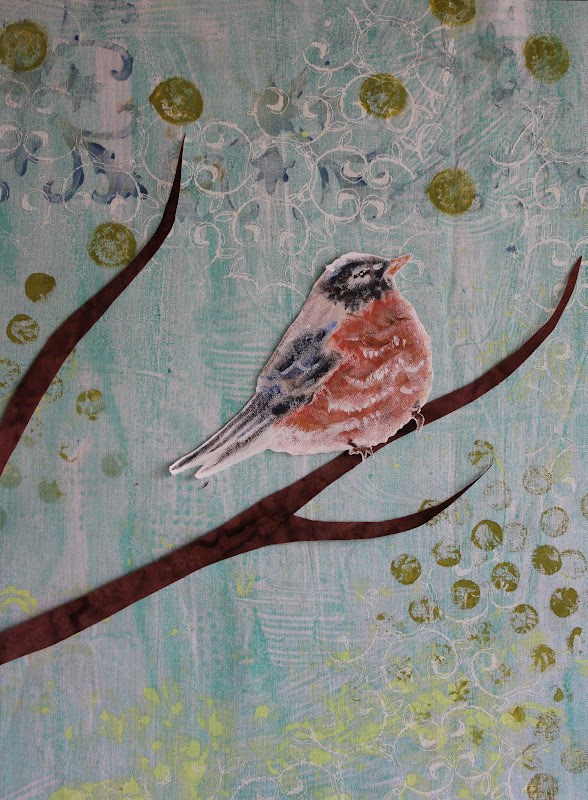 I had just enough time before going out this morning, to fuse and cut out the branch for my robin. I still haven't completely made up my mind, but I think I'm good with it. 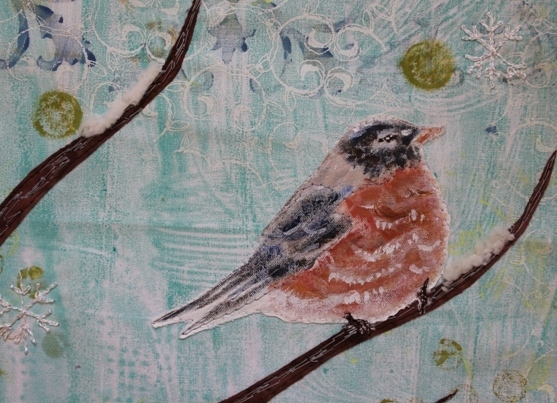 What do you think, can you picture frosty air and snowflakes on that background? 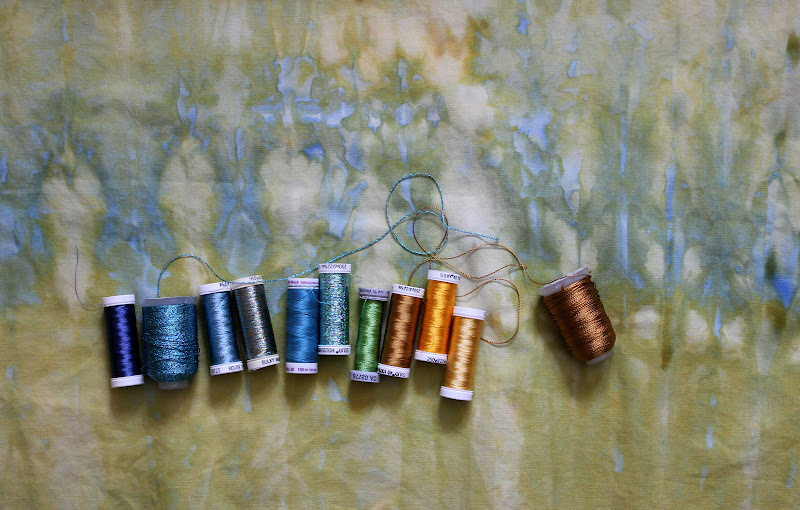 If you would like to read a little more about me, head on over to The Needle and Thread Network for their Friday Feature . I'm so excited to be featured; I even added a picture of myself which I hate to do! I realize though that it is nice to be able to put a face to someone when you read about them and correspond with them. I'm having a low energy day today so I'm not doing too much other than a few groceries this morning. 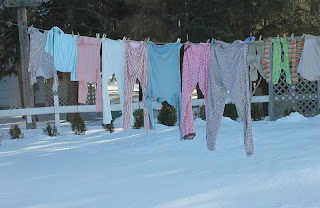 It is a good time to do a little dreaming about what I might do with my ice dyed fabric. I have decided to leave it all in one piece and do thread work on it keeping it very abstract although I do have a theme in mind. It is just big enough that I think it will be better to hand baste it to the batting and backing. The camera is just not picking up the actual rich colors in the piece. I'm missing threads in the mossy green color. 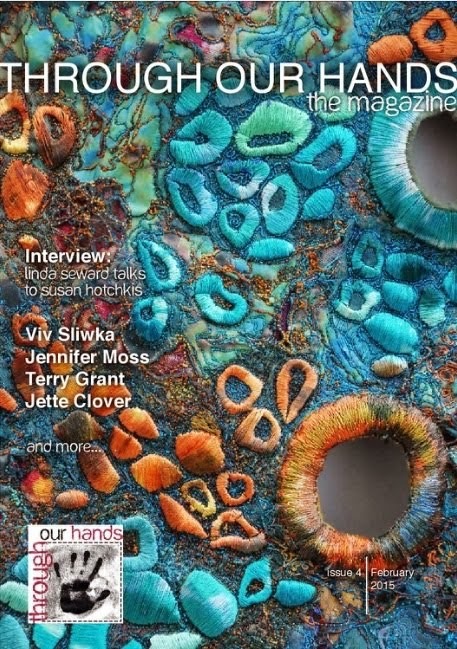 While reading the blog, Marveles Art Studios, I've been learning and inspired with her beautifully textured thread play. Leslie recommended Superior Threads where there are all kinds of thread and needle information with reference guides that you can print off. Currently, I am filling my shopping bag with some of their 'deal of the day' threads, as I cannot access much thread where I live. 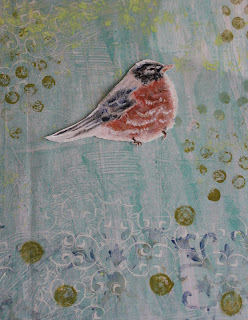 I took my little scissors and cut my robin friend out. I'm thinking of putting him here, on a branch of course. It's such a wonderful textured background; I see adding free motion and maybe some bobbin work snowflakes.There are a few little spots where I want to touch up the painted robin too. Can you see snow in that background? The robin finally got the last apple off the tree yesterday and made little trails all over the yard while pecking at it. I'm writing this quickly as I must get ready to go for my Wednesday swim at the spa. Last night, I finished stitching down the binding on this little quilt with the cornflowers. It is about 4 by 9 inches which makes it kind of like an elongated postcard size. I'm quite pleased with the corn flowers and I like the bit of iridescent fabric paint that I added to the flowers. I have just added it to my shop. Also, I put the finishing touches on my 2nd cosmos piece which is destined to be on the front of a friends sewing machine cover. 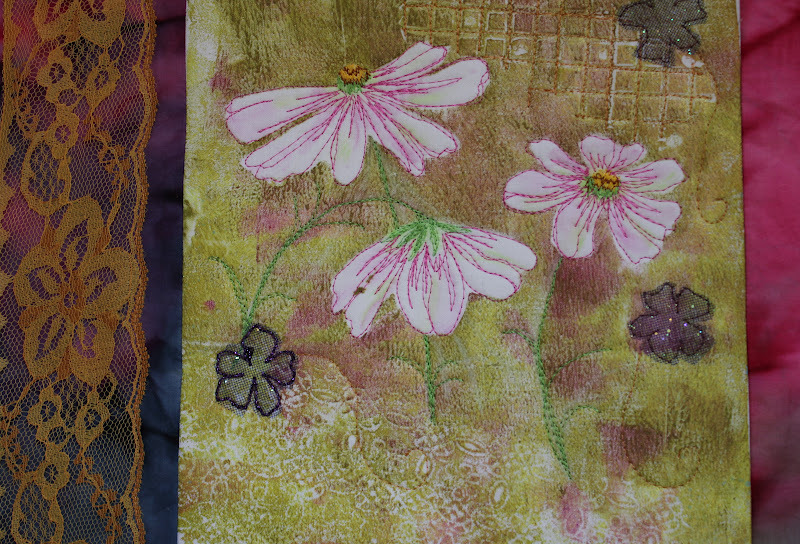 I added a few beads to the centers of the purple flowers and a small patch of embroidered white flowers. She is my swimming friend, so I will take it to give to her today.If you look very carefully, you might see that I free motion quilted my name into the left border. What an absolutely glorious day, blue sky, sparkling white snow, a temperature of about 5C. Who could resist getting out for a walk? 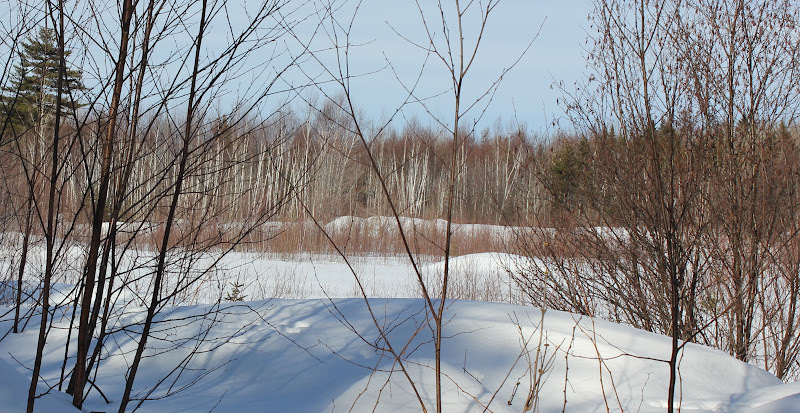 We have a nice blanket of snow, nothing compared to last year though. I was not able to hang my clothes out as I did today because they would not clear the snowbanks. This is the view from my studio. I like it! 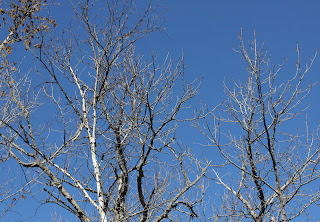 I took the camera and went for a walk on the trail. It is so pretty this time of year. 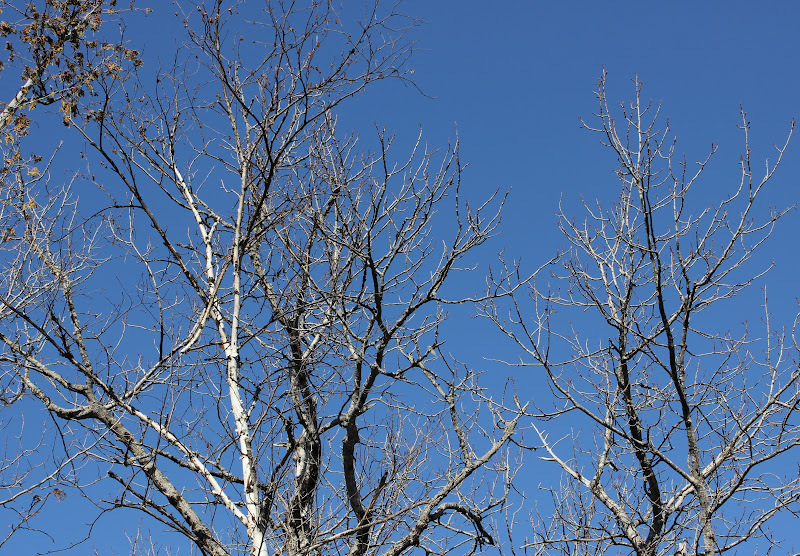 The sky was so brilliantly blue. 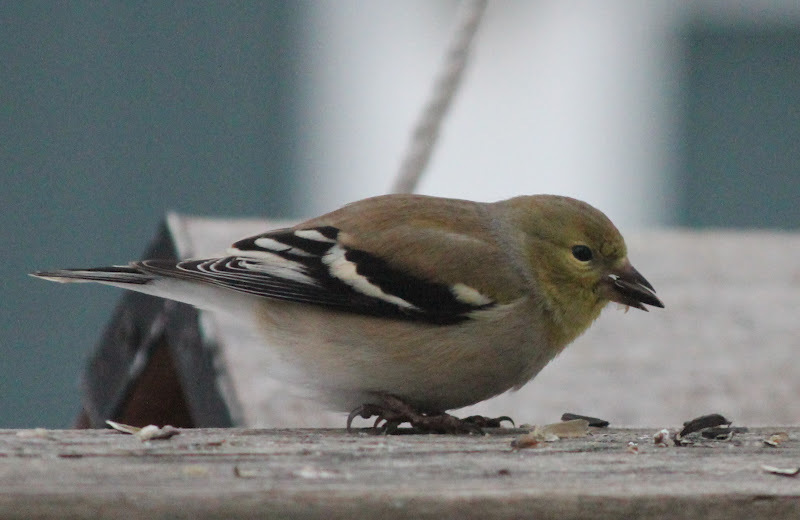 I always have a bag full of birdseed in my pocket just in case. I'll have to share another picture of the chickadee as I think this one is cute. I have the camera around my neck, holding it with one hand against my shoulder and focusing it before the bird alights on my hand. Also, I set it on the sports setting so it will will rapid fire pictures. 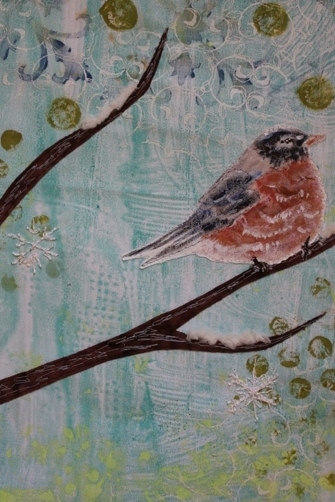 I spent a little time painting my chubby winter robin today too. 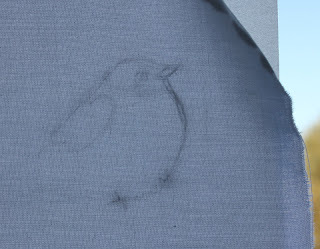 First I taped the drawing and the fabric on my window and traced the outline with a pencil onto the fabric. I pinned the fabric to a piece of foam. 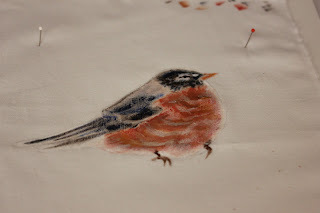 To paint I used Winsor and Newton acrylics (I've had for ages) mixed with some Textile medium, colors burnt sienna, cadmium red medium, ultramarine blue, white, and raw sienna. That's all I had to work with along with 2 old tole painting brushes. Here is the base coat. I'm allowing it to dry for now and I'll see if I'll touch it up. I intend to cut it out carefully, so it can be collaged to another background. 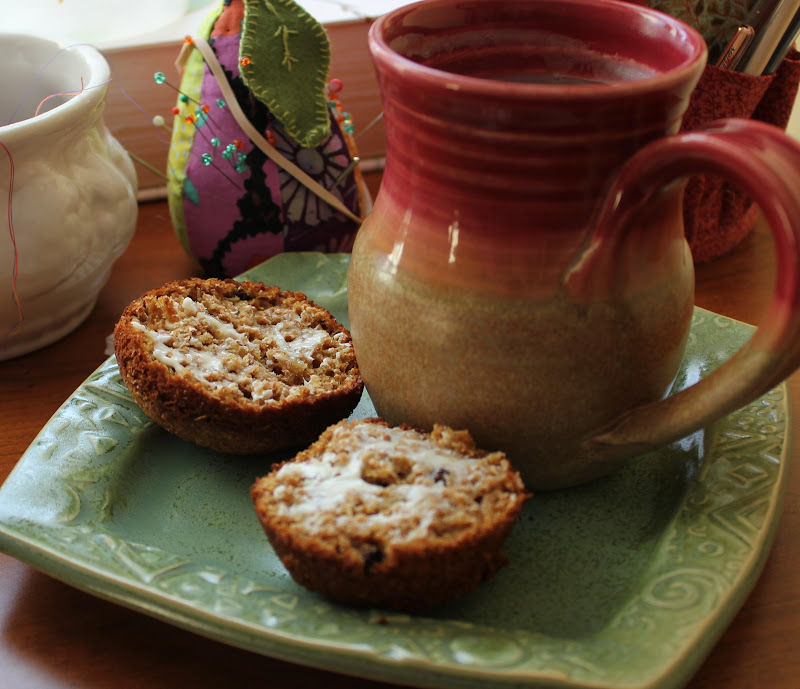 This method is described by Tracie Lyn Huskamp in her book, Nature Inspired. I am linking to WIP Wednesday at the Needle and Thread Network. This will be a quick post before I go take a soak with my book to soothe my achy muscles. I got my bit of housework out of the way this morning, and then this afternoon I was quite exhausted. 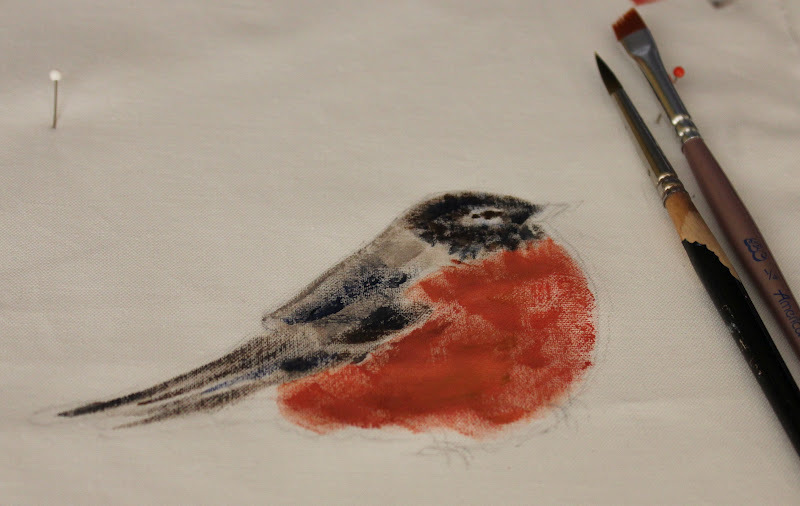 I wanted to paint another robin and this time on fabric. I did manage to gather together all the supplies but lacked the energy to get started. Some days are just like that. I did get the quilting finished and the binding sewn onto this little piece. I just need to hand stitch it down. Oh and if you happened to read my post about the tracing paper being hard to pick off, I had one of those 'duh' moments yesterday when I first woke up. I was supposed to put the paper with the pattern reversed on the backside and stitched it that way. The bobbin thread would thus have shown on top and I wouldn't have had to pick all the paper out. Duh! I had a little surprise waiting for me in the mailbox today. I had forgotten all about my bit of luck winning the apron pattern from Love, Laugh, Quilt a few weeks ago. I guess I'm lucky sometimes too! 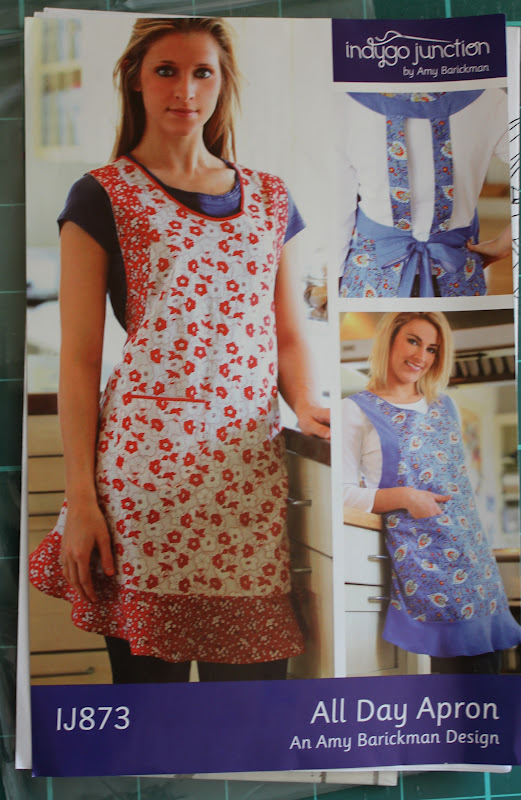 I made a couple of aprons as gifts this year; now I'll have to make more. I generally don't spend much time in the studio on Sundays. 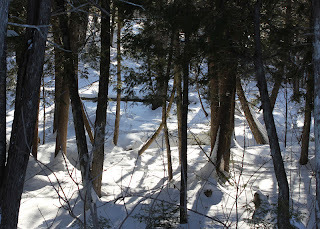 Occasionally we go out for breakfast as we did today and we may walk or snowshoe. Today, we walked and then we visited the in laws. I sat down in front of my computer at around 4 PM with a cup of tea. 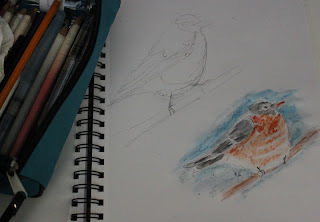 Having enjoyed the bit of sketching and painting of the cornflowers in the last few days, I decided to try some quick relaxed sketches of my 'winter robins'. 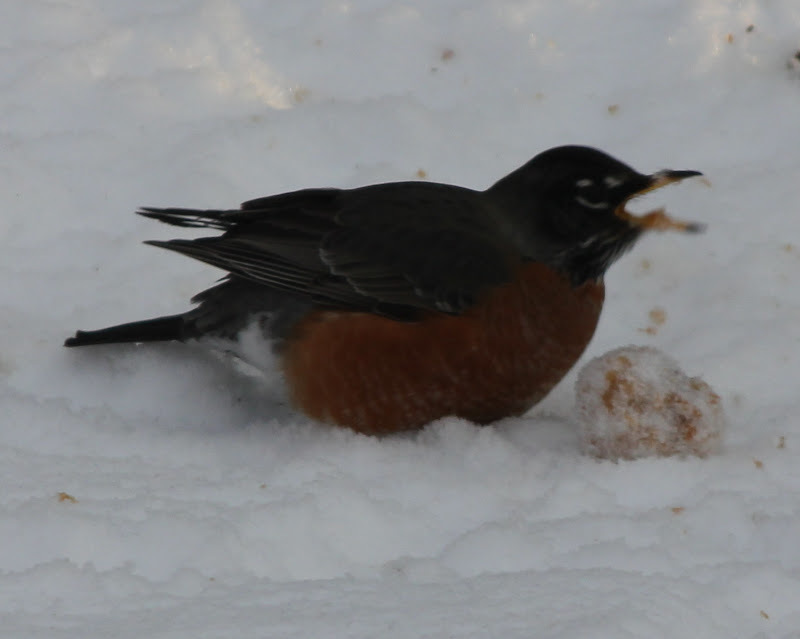 I've been writing a bit about these robins that stay for the winter all decked out in their fluffy white underwear and who feed off the frozen berries and apple trees. After watching the antics of this one yesterday and taking a bunch of pictures, I decided to try a bit of sketching. I wanted them to be quick, get acquainted type sketches, so I did them in my cheap sketchbook. Then I decided I should add some color for reference. I used my watercolor pencils but the paper started to ball up a bit. I'm thinking of how I might reproduce it in fabric. Just after 5:00 to-night, I had my husband draw a name for my magazine and bookmark giveaway. It occurred to me earlier that it wouldn't look good if, my friend, who lives just a few miles down the road from me, won. Someone might think it was fixed! I assure you I did my best to be fair and to my surprise it was indeed my friend, Wendy who won! We meet sometimes for coffee so I'll only have to hand it over. What gets me is she just won another lovely giveaway that we both put our names into. I just want to remind anyone who might have missed it, to go to my February 14th post and make a quick comment if you want to join in for the magazine and the bookmark.I'll make the draw tomorrow. A couple of weeks ago our apple tree was inundated by a flock of winter robins. They took an afternoon to clean out all the frozen apples left on tree. 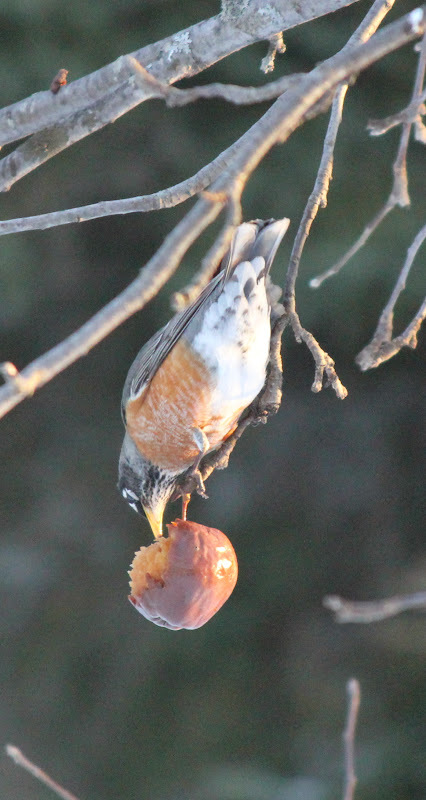 There were two lone apples left, and yesterday I watched this one robin's shenanigan's as he bounced away on a flimsy branch while pecking at an apple. This morning he succeeded in knocking it off and then he rolled it all over the fresh snow while attempting to finish it off. A few minutes ago I took this picture of the robin back on the tree having a go at the last apple. 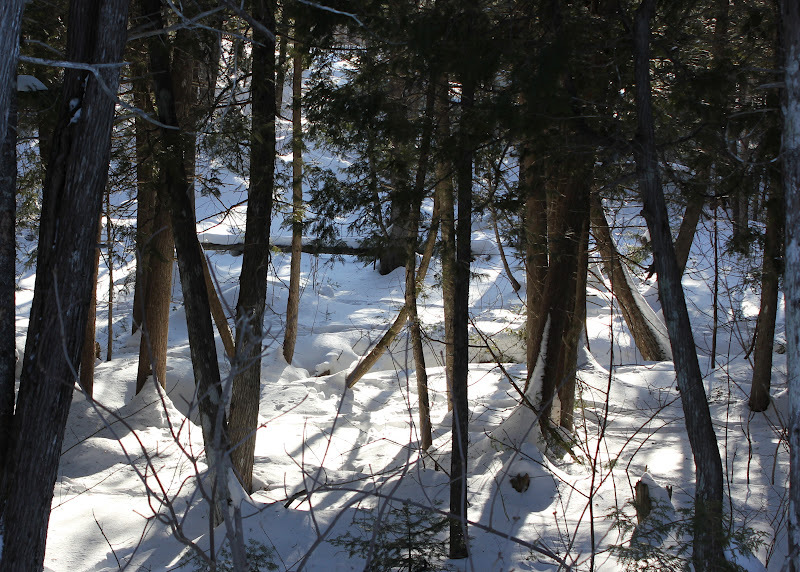 After lunch, my husband and I went out into the woods with our snowshoes to walk a bit and to feed the chickadees. I'm sure some readers may get tired of seeing similar pictures, but it is always a thrill for me to have them on my hand. 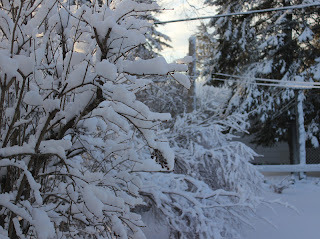 Everything was white and sparkly after the fresh snow. 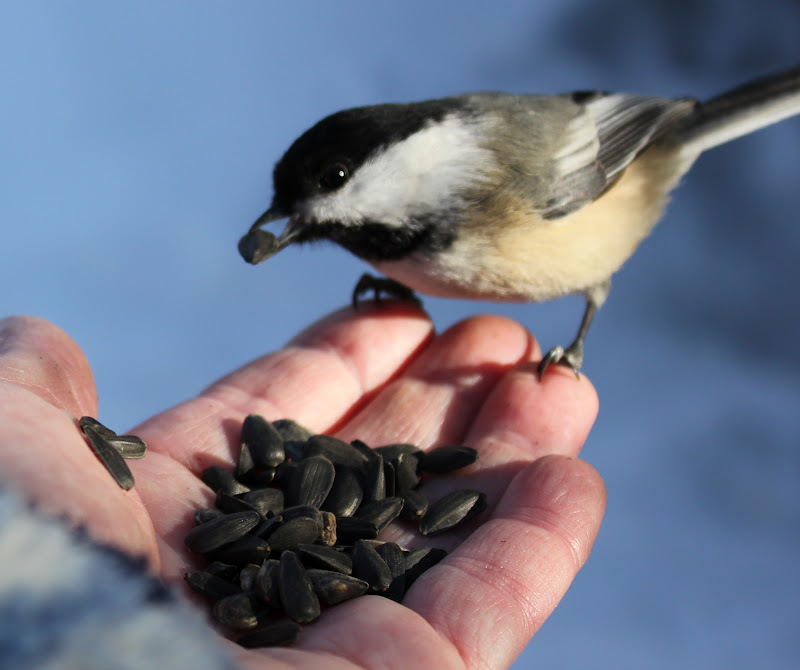 It was mild today and I was actually wearing one less layer than normal, so it was lovely to feed the birds. This little fellow was very interested. 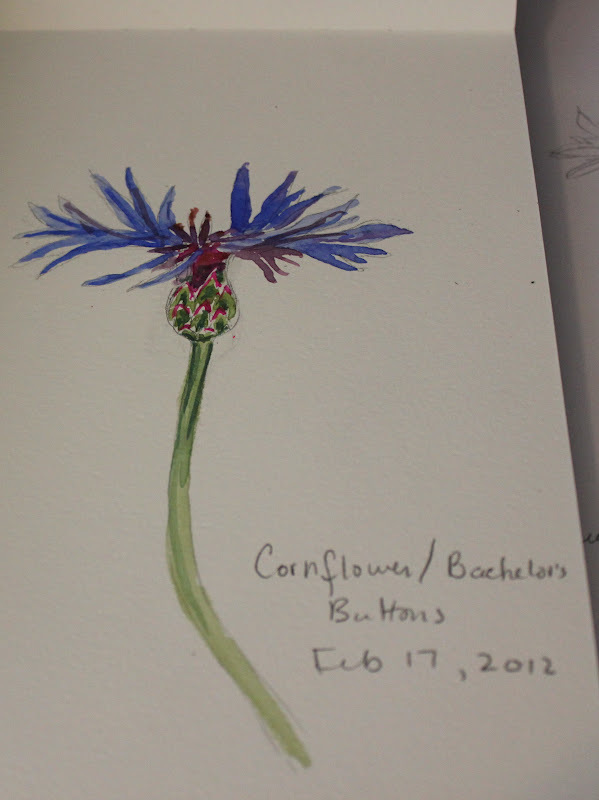 The rest of my day was spent with my head and hands in my sketchbooks rendering more quick sketches of the corn flowers. Some of these I've done on tracing paper. I wanted to use it as a pattern for some free motion sketching on a fabric piece. I got so wrapped up in it that I had to bring my tea and bran muffin into my machine. In the past, I've use water soluble stabilizer but was not completely satisfied. I found that not all the bits would dissolve and I didn't like the feel of it afterwards. Perhaps there are better ones . I have tried only one or two. I have read that one could use tissue paper so I tried it. 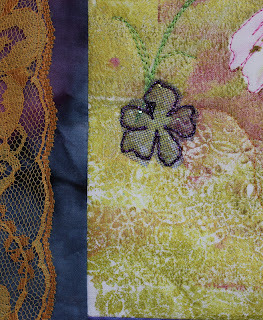 It sews well but is not that easy to pick off in between fine lines. For larger bits it's perfect. After picking at this for a while I finally soaked it in water to get the rest off. 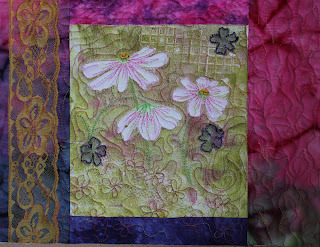 This is done on a strip of fabric that I cut from Margaret Applin's fabric for our collaboration. I've decided on something else for the larger piece so I think it's OK to show this. My deck and feeders this morning were covered with gold finches that i watched while I ate breakfast. 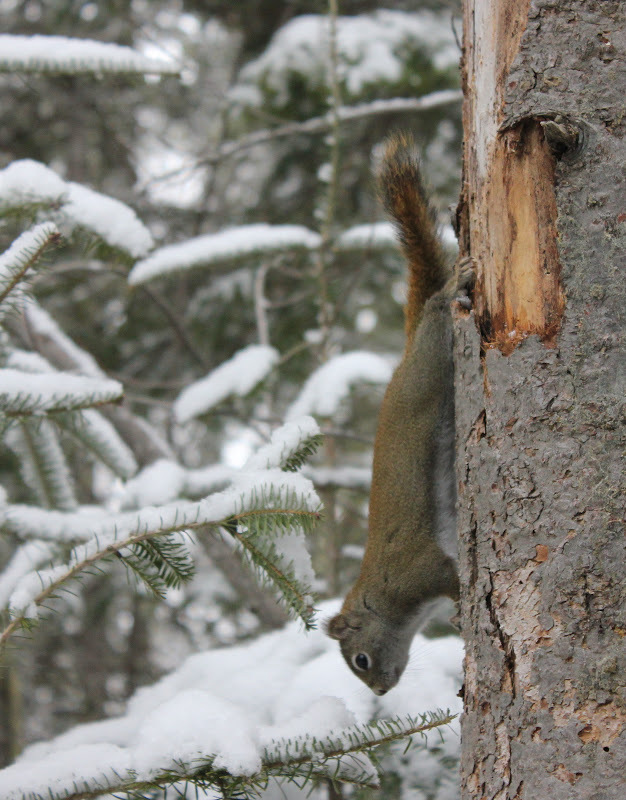 The males and females all look the same in winter. 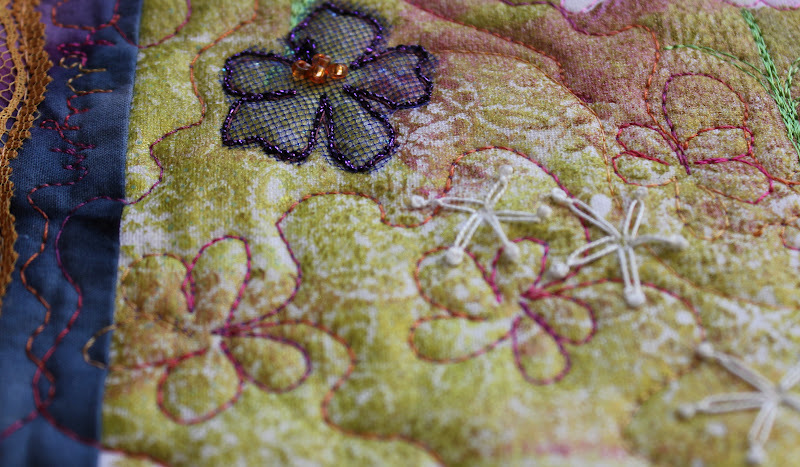 I'm kind of in between projects now, except for a little beading on the cosmos piece. 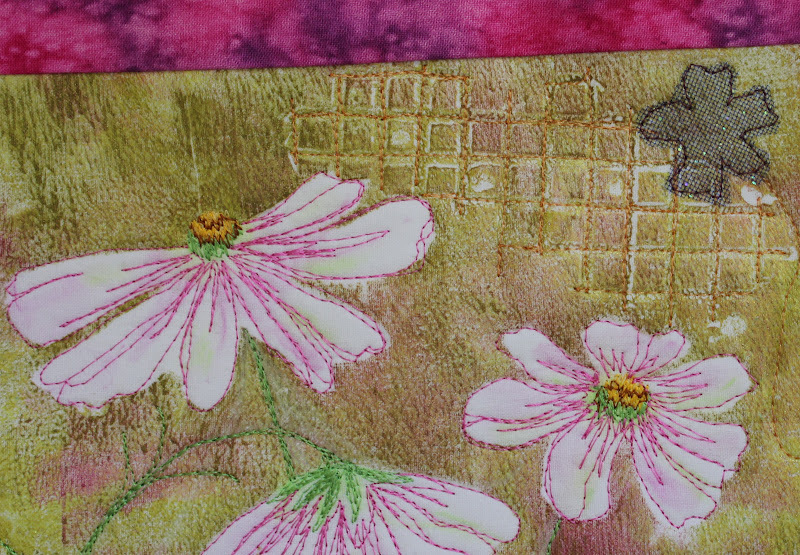 I have a couple of things that I'm working on that I can't show, a quilt and Margaret Applin's piece of fabric. So, I shall be contemplating my next piece in between these things. 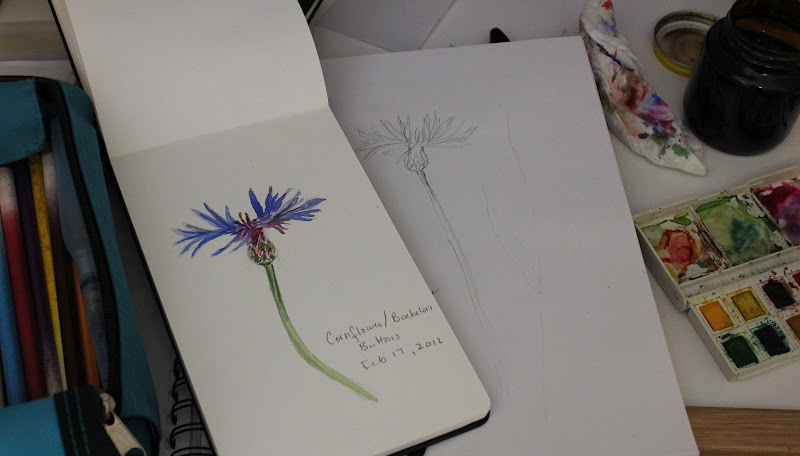 I did my Friday errands and lunch today and after I got home, I pulled out my sketchbook and watercolor book as I've been wanting to get acquainted with some summer flowers that I fell in love with last year, the Cornflower or Bachelor's Button. I discovered that they are perennial and that they come in many shades of blue, purple, and pink as well as many different shapes and sizes. I hope to add these to my garden this year. I'm practicing. This variety is so delicate! I had a doctor's appointment this morning and afterwords stopped for a few groceries. Once they were looked after, I went to my studio to do some more on the second cosmos piece. 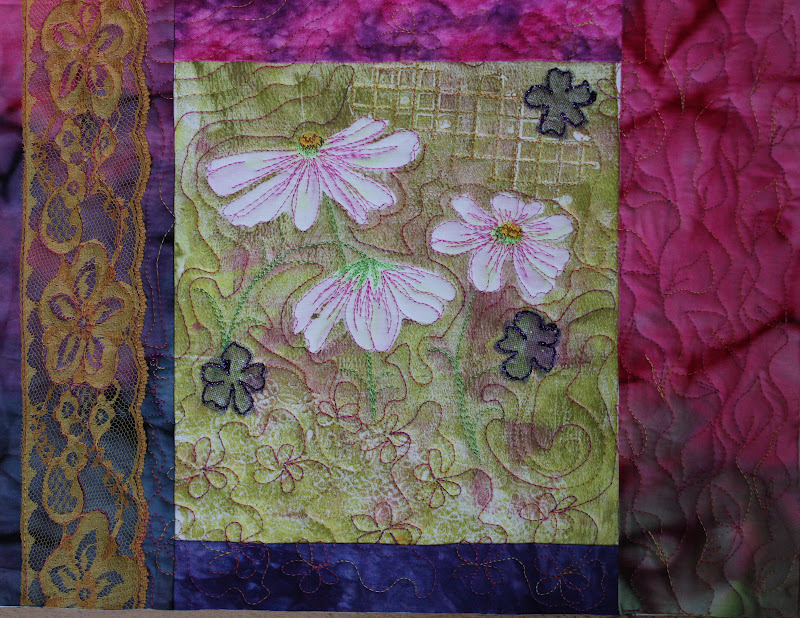 I finished up the bobbin work on the three little purple flowers, and once I got going with the free motion to fill in the rest, I couldn't stop until it was done. This is going to be on the front of a sewing machine cover. 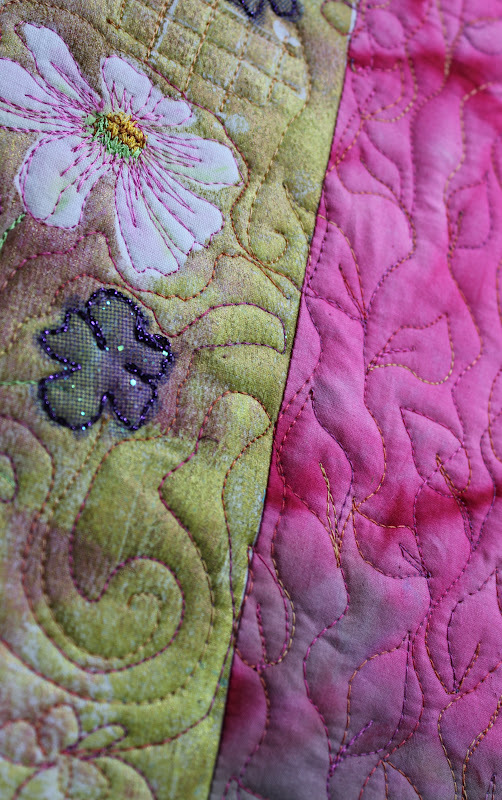 It's a little more heavily quilted than I usually would, but I find I quite like it and will likely do more in the same vein. I did little free motion flowers. 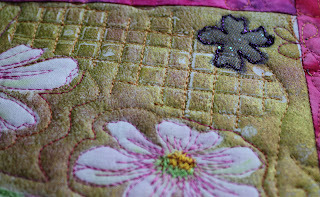 I love the texture in the gridded area too. To-night I plan to relax, since, this morning, I got my 20 minute walk in, as well as some yoga. If I feel like sitting at my computer to look through some of my photos, I may do some sketches for my next project. That is one of the reasons I'd like a tablet, so that I could sit with it on my lap and read blogs, surf the net, or even look at my photos to draw. I'm just going to wait until I can afford the one I want. I'm thinking about the Samsung Galaxy. I went for my morning swim and sauna this morning. I did only 20 minutes today of laps in keeping with the doctor's directions, but it was very relaxing, especially the sauna and whirlpool. 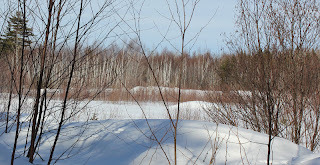 It is so nice and sunny outside to day too, a balmy 2C here. 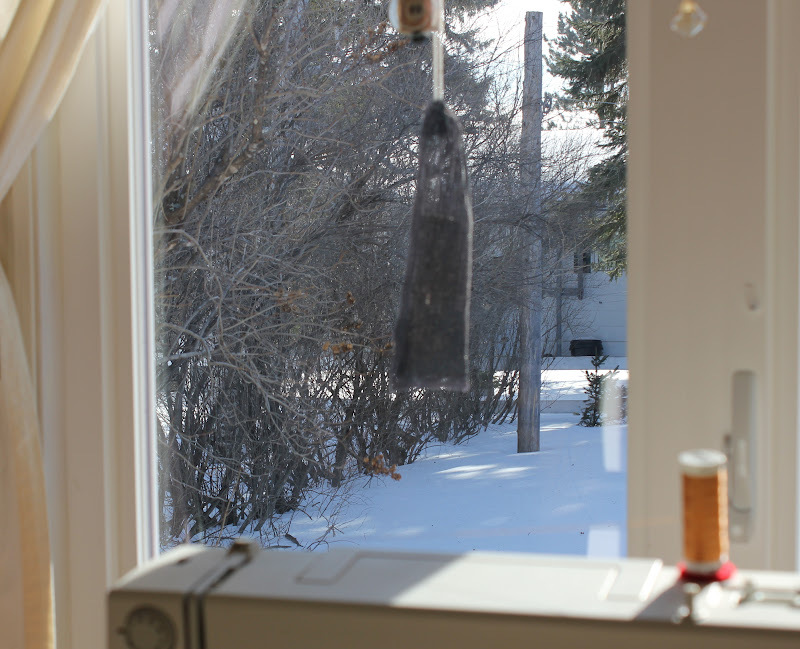 I have my sewing machine facing the window so I can get the full sunlight in winter. 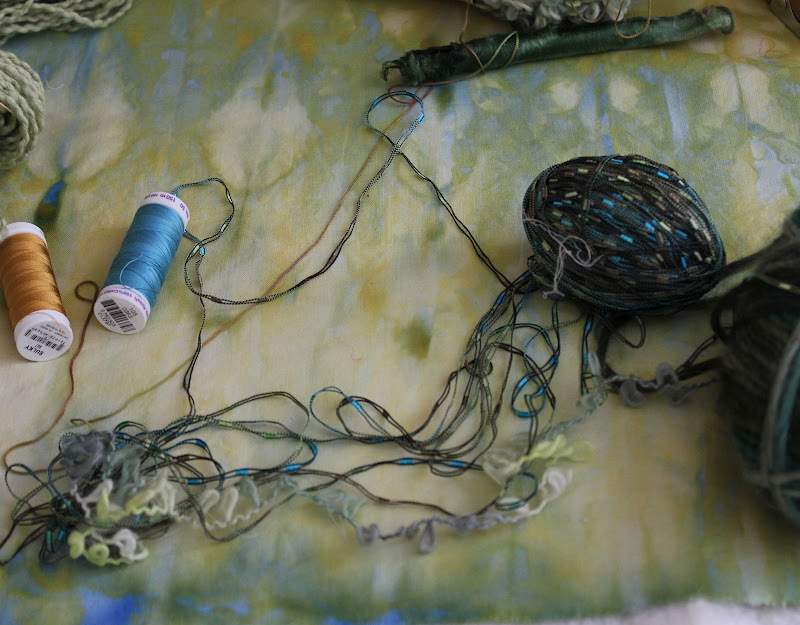 After lunch, I was anxious to get back to the 2nd cosmos piece I'm doing for my friend's sewing machine cover. I finished sewing in some ends, did a little more free motion stitching--the grid and then I added some sparkly tulle flowers. What I did was cut the flower shapes form the tulle and stitch them down with regular thread on the right side. Then I could follow the stitching lines to add an outline working on the reverse side using the purple Razzle Dazzle in the bobbin. Now, I need to make a quick run to the grocery store and then take my little rest before dinner. Don't forget to check my last post for my giveaway!